Binauric's new wireless speaker to 'evolve features over time' | What Hi-Fi? Looking for a wireless speaker? The increasing choice available means we're spoilt for choice – but we've not come across one that evolves 'new features' over time. 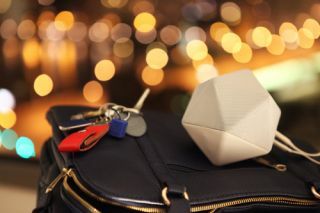 Boom Boom – the new speaker from German firm Binauric – comes with the Bluetooth connectivity and audio playback function you'd want, but also a handful of features yet to be activated. French designer Mathieu Lehanneur told Wired the extra functions such as an accelerometer, light sensors and microphones "are like sleeping components that are waiting to be woken up". It's also claimed that an app-controlled recording feature that will let you record voices and sound will be coming to the Boom Boom in a "few months". So what do you get with Boom Boom from the off? It will connect with your iPhone or Apple device, or your computer via Bluetooth 3.0 connectivity or a cable that plugs into a headphone jack. It weighs just 350g, comes in three colours and can handle phone calls. If that's not enough, Boom Boom will also tell you in a variety of languages "about what's happening when you use it". Boom Boom costs €199 (£164) and is available from the Binauric website.